I'm running a little late today. I'll blame it on being sluggish from the enormous sundae I had yesterday... mmmm. Today I'll be digging through the rubble that is my house after a leisurely weekend, and hopefully finishing up a few small projects. This morning I did get a few more buttons put in my lilfishextras shop and 2 mossy wool brooches in my lilfishstudios shop so I'm feeling good about that. If I can stay away from the rest of the ice cream in the freezer I just might have a productive week. It would seem I've been evicted. From Thirtyville. (as coined by the talented girlsavage) Yes, today I have packed my bags and moved into Fortyville. I've already had a look around the joint and it looks OK from here. Bacon and nutella for breakfast, lunch with my husband (without kids! ), and the promise of ice cream. I took advantage of my birthday status this morning and worked a little more on a project I've had in the works. I hope to have it finished soon so I can show you. I also had a chance to work on more mossy brooches yesterday. Some are already spoken for, but there will be a few in my shop early next week. Yesterday was a busy day and didn't go quite as planned. I'm feeling a few steps behind today and I'm nursing a cup (or stein as my friend Karen would say) of coffee and pondering instead of doing. All topics for another day, but these are subjects that rattle around in my head when I'm not chasing kids or poking wool with needles. For now I'll leave you with a well-known poem by Frost that I love, and my favorite quote from Thoreau so you can do your own pondering.
" All that I could say, then, with respect to farming on a large scale- I have always cultivated a garden- was that I had had my seeds ready. Many think that seeds improve with age I have no doubt that time discriminates between the good and the bad and when at last I shall plant I shall be less likely to be disappointed." I spent some time packing up 1-pound bags of vintage buttons from the giant tub of unsorted buttons I talked about yesterday. As promised, I've added some to my de-stash shop, lilfishextras. To be sure I didn't go through the stash and "pick" I had my kids fill up the bags for me. When they were done I added one or two special buttons to each bag, just to be sure there were some fun things to discover in each. A lot of these buttons will be utility buttons but I'm sure there will be some fancy ones and some "not buttons" in there too. Fun! Remember, you can enter the giveaway to win one of these bags for your very own by leaving a comment on yesterday's post. Comments will be open until Fri. Jan 28. I'll be working on adding more vintage buttons and other vintage goodies to the de-stash shop over the next few weeks so if that is your kind of thing, I'd love it if you'd stop by and have a look. In other news, the weather has warmed up a bit here (20s! Yay!) so I hope to be able to get out to the barn and cut some wood buttons today. Of course, this is dependent upon nap schedules around here, as most things are. I've been working on a few more mossy heart brooches to put in my shop but am out of wood buttons. Can you believe it? Me, short of buttons? Ha. Button Monday and a Giveaway! Some of you may know that I have a rather sizeable stash of vintage buttons. I love old buttons and enjoy working them into my projects. I love the history behind them, the odd shapes and colors, and the strange not-buttons that I find mingled amongst them when I buy an old button jar. Mostly, I love the diggin', the pickin', the explorin'. 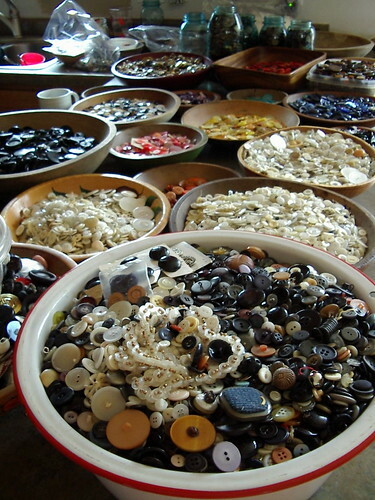 I have more buttons than I'll ever use but still...when I see a jar of buttons at a thrift store or yard sale, I have to buy it just so I can dig through it. I have some of my buttons sorted but I have about 50 pounds that I haven't yet sorted. In fact, they've been sitting in my workspace for about 2 years now sooooo it's time for them to go. Since I know there are other button-lovers out there, I thought I'd start my de-stash with a giveaway. Yay! I'm starting with a pound bag o' buttons. If you'd like to dig through some unsorted old buttons for yourself, then leave me a comment on this post and maybe you'll get one for yourself! I'll pick a winner on Friday Jan. 28 so please be sure I have some way to contact you. I'll ship worldwide, so come on fellow button lovers, let's see what treasures you'll get! Tomorrow I will start adding buttons to my (now empty) destash shop - lilfishextras - so if you're interested, come have a look. I'll be adding a bunch of these unsorted bags o' buttons to the shop as well as a few more, but if you're looking for a certain kind of vintage button, just ask and I might have it for you. What do I do when I wake up to temperatures like this? I stay inside and update my Etsy shop. That is just what I did yesterday. I had a few brooches completed so I took a few photos and added them to my shop. I have a few other pieces in the works (new stuff!) and will be adding them to the shop sometime next week. Yesterday's additions were brooches, a few birch bark pieces and a few oak and wool. Each of these wood brooches has been cut from a downed branch that I've hauled out of the woods. All of these are oak which is a nice sturdy wood to work with. I cut them, shape them, sand them, drill them, wax them, and embroider them. I gather the birch bark myself and then peel it into layers and use it as a veneer. I make the wool felt by hand. It's a labor of love. It's important to me that these feel natural and unique. I want them to feel like something plucked from the forest floor. I cut them in organic shapes and leave angles and planes on the wood to remind the hand that holds it that it is handmade. I can't wait to share what else I'm working on. Soon. Check out what I found in the Crafting For Ourselves group this week. It makes me happy to see you creative souls taking some time to create for yourselves. It can be hard to make the time, but I really think that we benefit, in a number of ways, by spoiling ourselves with our creativity from time to time. Thank you all for joining in. I finished up some wool stones over the weekend, a project that I really enjoy. These were a request from a customer of mine and something that I haven't carried in my shop in a while. Since I had so much fun making them I decided to do a few extra and they'll be in the shop later this week. These are made with real stones in the middle and I like them as natural decorations scattered around the house and as photo props. My kids really like hauling these around too and stacking them up. I think there's something about the soft wool and the heft of the stone, it makes a nice combination. I'm also working on few more birch brooches today. I cut discs from downed branches, shape and sand them, and then apply a thin layer of birch bark like a veneer on top. I then drill holes and embroider designs on them. I finish the sides and back by rubbing it with local beeswax. They're simple and natural which appeals to me. Since I had the tools out I put together some small birch tags for my packaging too. And yes, I'm making that mess on my kitchen table, much to my husband's dismay. I know. I know. We had a good weekend here despite the youngest falling on the steps and cutting her cheek. Hubby made soft pretzels which further convinces me we have some kind of mind-reading thing going on because I was just telling Joanie how much I loved his soft pretzels. The kids watched a movie or three. I sent some birch brooches on a flight to somewhere special. Maybe I'll have something to share about them in a few months. The baby girl has completely scribbled out the entire month of September in my planner. So apparently my September is booked. Food is my hot button and I could bore everyone to tears with my views, and probably did after reading this blog post. Not many chores got done this weekend. Laundry, cleaning, soup in the crockpot. Maybe crafting too, if I get away from this computer. My daughter was so serious about watching the birds that she decided to camouflage herself and pull out the binoculars. Someone should tell her she's looking through the wrong end. The other day I horrified serenaded my oldest son with this song. I remember listening to it on my aunt's record player and thinking it was hilarious. He was slightly less enthused. To all of you, I wish a good weekend minus birds of paradise and elephant toe-massages. I spent a little time yesterday working on a project for me. The baby girl was down for a nap (insert angel-singing noises here) so the intrepid 4 year old and I shared the table for a little creative time. I am working on making wool stones out of wool sweater and roving. I need several hundred stones for what I plan to do so it should put at least a small dent in my wool stash. It should also take me quite a long time. My goal is to finish it before the end of the year. A was refining his family portraits in orange. The large orange blob is a potato on our heads, in case you're wondering. I thought for a moment that daddy had a really awesome hairdo, but nope, potato. Here's wishing you some good creative time this week too. For those of you that asked about the cinnamon roll recipe my husband used to make the delicious treat seen in yesterday's post, well it seems it's not such a secret. He uses Paula Deen's cinnamon roll recipe, found here. The only changes he makes is that he doubles the recipe to make enormous rolls, which yields giant inside pieces (my favorite part). He also uses brown sugar instead of white and adds cloves to the cinnamon. It makes the rolls kind of caramel-y. When eating, he is adamant that you slather a glob of butter on top of it. It's Monday. I'm eating breakfast at my sewing machine and putting together yet another pair of mittens for my kindergartener (who loses every.single.mitten. I make for him). I'm reminiscing about breakfast meetings in my past life that involved catered-in pastries and expense reports and though sometimes the occasional doubt creeps in, I think this kind of working breakfast is better. Hubby's homemade cinnamon rolls and coffee by the light of the Singer. I hope your week is off to a good start too. Keeping chickens has been a really rewarding experience for us. We enjoy their personalities (they have them, they really do), we benefit from their bug-eating activities, and of course we love having fresh eggs free of antibiotics at arm's reach. We've seen different shapes and colors of eggs, some double and even triple yolkers, some without yolks at all, but we've never seen an egg quite like what we found in the coop yesterday. This is the teeny tiny egglet next to a regular egg. Of course we had to crack it open to see what was inside. My son just had to cook it up and eat it and he giggled the whole bite. Perhaps our girl was just taking it easy for the weekend. I can't say I blame her, we all need a break now and then, right? Hope your weekend has been easy going too. Color, glorious color! 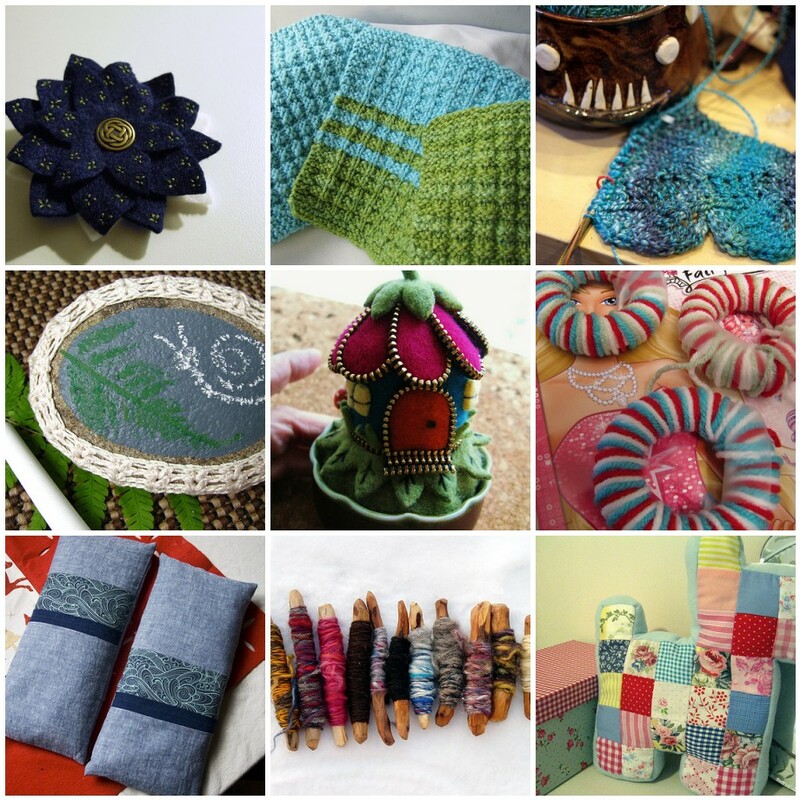 Check out what I've found in the Crafting For Ourselves Flickr group this week. Have you resolved to make more time to create for yourself this year? Come show us what you're working on, we'd love to see. It can be hard to carve out time to create for your own benefit but it can be so rewarding. 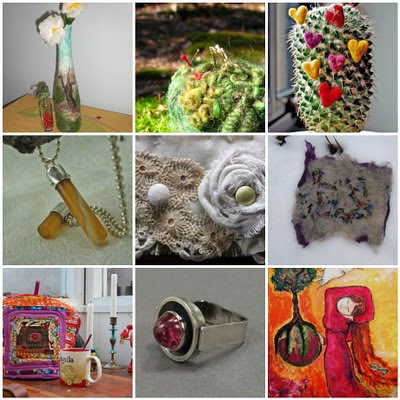 So, show us your knitting, your baking, your works in progress, we'd love to see. I, as of this moment, haven't had a lick of creative time this whole week but you can bet that I'll carve some time out this weekend. I hope to have something, scratch that, I WILL have something to show you next week. I headed outside to gather eggs and decided to bring my camera along. Despite the cold (it hit 4 that day! woo hoo! ), the sun was shining beautifully and luring me out to photograph the sparkly snow. The sky was remarkably blue and seemed to bathe the entire landscape in the color. Ice covers the twigs on the trees and everthing from my flowering plum to the tops of the tallest poplars were glinting in the sun. Though the creatures themselves aren't seen often these days, we see plenty of signs of life. Mushrooms hold their own against the icy cold, seemingly unaware of the chill. Icicles are growing and my birdhouse sits idle, waiting for spring visitors. When I stopped near the side of the barn I looked down to see the snow peppered with hoofprints. We've seen a new herd of deer in the yard lately and apparently they've been walking right up to the barn like they own the joint. I like to think they're leaving tiny hearts in the snow for me. I followed the tracks down the driveway towards the mailbox, marveling at all of the fancy footwork along the way. As I neared the road I looked up to see the herd bounding away in front of me. Apparently I had followed them right down the driveway without noticing. ( I have a tendency to look down rather than up) They crossed right behind the mailbox and went off into the woods again. The view from the mailbox today. And lest you think there isn't any color in my woods right now besides white and blue, here is some pine green making a typical Minnesota winter color palette. what color palette is out your window right now?